Philanthropy may undoubtedly be the new buzzword in the world of the famous and rich, especially when it concerns world-renowned foreign universities, but the imposing edifice of the Indian Institute of Advanced Study (IIAS) here is waiting for some industry giant to shower its generosity on it to help it undertake restoration and conservation work. The Border Roads Organisation (BRO) today completed the first km of the world’s highest 8.82-km-long Rohtang tunnel whose idea was mooted in 1983. The north portal of the Rohtang tunnel, which is located near the surging waters of the Chandra river. Photo by writer. ICICI Lombard General Insurance Company has been given the mandate to provide weather-based crop insurance for the ensuing Kharif season in Bilaspur district.It will provide cover for the tomato crop for the period starting from June 15, 2011, to December 15 in the Sadar block of the district for farmers. Commuters, especially schoolchildren, were put to a harrowing time during a traffic jam between Khalini-New Shimla-Vikasnagar for almost three hours today as the PWD authorities have closed both link roads from Brock Hurst and Kasumpti for repair work. The Solan Sessions Court has framed charges against former VC of Horticulture and Forestry University, Nauni, LR Verma and then Registrar PS Kutleharia in the infamous jobs-on-chit scam, a major political issue between the ruling BJP and the Congress. The district police today arrested five more employees of the Himachal Pradesh Board of School Education (HPBSE) in the examination scam. The arrested employees are Rajinder Sharma, Sanjay Kapoor, Karam Singh, senior assistants, Anoop Lal, senior assistant, and Behari Ram, junior assistant, dealing with 10+1 results. 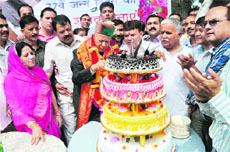 With big advertisements of greetings inserted in newspapers and his supporters turning out in strength at his residence to extend good wishes, the birthday celebrations of Union minister Virbhadra Singh, who turned 77 today, was converted into a political event. A team of Vigilance and Anti-Corruption Bureau, led by Additional SP Vimukt Ranjan and DSP Ramesh Sharma, arrested Executive Engineer (XEN) of HP State Electricity Board Pritam Chand while accepting a bribe of Rs 50,000 from an employee of an industrial unit at Nahan this evening. The Education Department yesterday issued orders to suspend the headmaster of a government high school at Kharian, in the subdivision, following an allegation of outraging the modesty of a woman teacher posted in the same school. The Director of the Education Department had deputed the Deputy Director, Elementary Education, Kangra, for conducting an inquiry into the complaint and following his report, the suspension orders were issued. Despite more and more Indian business tycoons making it to the Forbes’ list of billionaires, the imperial building of the IIAS here has failed to attract their generosity to undertake conservation work even though some foreign institutes have gained from their largesse. The IIAS had recently approached industry giant, Kumarmanglam Birla of the Aditya Birla Group in the hope of getting financial aid required to undertake extensive restoration and conservation work of the building. He had visited the building during a visit to the erstwhile summer capital of the British some time back and evinced keen interest in its heritage. “After his visit here, I wrote to him with the hope that he would provide us the financial resources required to preserve this magnificent building as it is need of extensive conservation and restoration,” remarked Prof Peter Ronald de Souza, Director of IIAS. Unfortunately, there has been no response from the industry titan who has been placed on the 97th rank in the Forbes’ list of billionaires. The IIAS requires about Rs 100 crore to push through the conservation plan which has been prepared by top conservation architects of the country, but has not been put into action for want of finances. The IIAS authorities have also sent feelers to some top business houses to help them save the building from further damage, but with little success. It was based on the concept of “Gandhi’s Trusteeship” where he advocated that the wealthy should keep only a very small percentage of their income and spend the rest for the welfare of others who needed it desperately. Incidentally, GD Birla, uncle of Kumarmangalam was a firm believer in this concept of Trusteeship, along with other businessmen, including Jamna Lal Bajaj. Ratan Tata has shown generosity in giving $ 50 million to Harvard Business School, his alumnus and $ 10 billion by Anand Mahindra to Harvard Humanities Centre. The high-quality wood especially along the exterior walls is decaying resulting in heavy leakage and crumbling plaster in the building which remained the residence of the Viceroy of India during the British rule. Located on Observatory Hill, the magnificent building was completed in July 1888 under Lord Dufferin with its other occupants, including Lord Reading, Lord Curzon, Lord Mountbatten and his wife Edwina. The Border Roads Organisation (BRO) today completed the first km of the world’s highest 8.82-km-long Rohtang tunnel whose idea was mooted in 1983.Chief Engineer of the project PK Mahajan declared that the first km of the tunnel was completed-965 m from the south portal side and just 35 m from the north portal side at Sissu. But Strabag, German firm contractor of the project, has been struggling to build its base at Sissu since March 4, 2010, when the work was kicked off by UPA Chairperson Sonia Gandhi. The remains of the Strabag office site and a bailey bridge at Sissu, devastated by a giant avalanche last winter, was still floating in the rushing icy waters of the Chandra river. The BRO has refused to learn any lesson as it is rebuilding its office on the same avalanche-prone point. The BRO is yet to resume its work on the north portal even after six months that has pushed the BRO’s deadline to complete the tunnel excavation work by 2014. The work at Sissu was suspended six months ago due to harsh winter as the tunnel is located at 3071-m-high altitude in the snowbound Himalayan ranges. Local residents had advised the BRO not to set up the site office at the avalanche point, but the BRO did not pay any heed, said Duni Chand Thakur, 83, a resident of Sissu. They have even questioned the safety of the tunnel’s north portal as it was located near the surging waters of the Chandra. 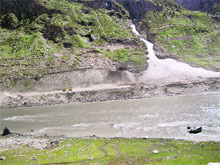 The river carried silt in summer and it was blocked by avalanches and turned into a lake in winter that could submerge the approach road to the north portal, claimed villagers. The firm has yet to transport its equipments to north portal as BRO has failed to maintain the 30-km-long Marhi-Rohtang-Koksar part of the Manali-Keylong highway for heavy traffic. But Mahajan said it was due to unusually heavy snowfall that the site office was damaged. “It is a makeshift office as we will shift steel containers to the hired accommodation in a nearby village in winter”, he added. He allayed fears of villagers saying the tunnel portal was at a safe site from the highest flood level of the Chandra river and the BRO is building a high bridge across the river. way to Leh is also built. The weather-based crop insurance scheme will provide cover against high and low temperature as well as excess and deficit of rainfall. The scheme will facilitate immediate compensation based on a certified data collected from independent third party bodies such as weather stations located at Swarghat, Namhol and Bilaspur. The transparent and objective method of claim settlement eliminates the need for carrying out field surveys. This is a unique insurance scheme, where the beneficiary is not required to file a claim for loss to receive a payout, instead ICICI Lombard will proactively intimates and settles the claim amount to the beneficiary based on the certified data collected. It is an index-based insurance product pioneered by ICICI Lombard and successfully adopted in 11 states comprising 60 districts covering as many as 26 variety of crops. The mismanagement on the part of the police as well as the PWD authorities resulted in utter chaos with people remaining stranded for almost three hours on the road. Surprisingly, the PWD authorities have started repair work, both on the Kasumpti-Chotta Shimla road as well as the Brock Hurst-bypass road simultaneously, notwithstanding the peak tourist season. The town has been witnessing the worst traffic jams, especially during office and school hours. With there being insufficient parking space, tourists park their vehicles along the roads compounding the problem even more on the Cart Road. With there being a traffic jam near Khalini on account of an accident, a large number of vehicles diverted towards the Brock Hurst road. With the Kasumpti-Chotta Shimla road already being closed for traffic, there was utter chaos near Vikasnagar. What was more interesting is the fact that barring one policeman near Vikasnagar, there were no cops to regulate the traffic. Dumping of sand and brick trucks on half of the road near Talland added to the woes of commuters. The sand dumped on the sharp curve outside the forest office road in the night was lifted only about 5 pm. Incidentally, this was the first scam during the Congress regime where charges have been framed by the court against those who allegedly gave jobs to people on political recommendations. The Sessions Court on Tuesday framed charges against Verma, the Registrar and beneficiary Sharmila Sharma, who got the job of a laboratory assistant. The arrested employees have been booked. They will be produced in the local court tomorrow.The other employees who were arrested two days ago have secured bail from the local court. With today’s arrests the police has arrested 103 persons in a case registered against accused in 10+2 board examination scam. The celebrations were in line with aggressive postures adopted by the five-time Chief Minister who was holding public meetings across the state attacking both Dhumal government and his detractors in the party. There were photographs of 33 important leaders, including 17 MLAs, who would be in line for party ticket in advertisements. Last year, similar advertisements led to much controversy within the party. The veteran leader performed the ceremonial cutting of the 77-pound cake to mark the occasion. There was no formal speech. However, the message was delivered through the weekly “Himalaya Surya”, the mouthpiece of Virbhadra Singh, the copies of which were distributed among the gathering. It contained several articles critical of PCC chief Kaul Singh. In an article, it was said action was being taken against party workers on regional considerations. In yet another piece, it was stated that slogan shouting in favour of Virbhadra Singh was not being relished by Kaul Singh. Prime Minister Manmohan Singh and several central leaders were among those who felicitated him on the birthday. His supporters organised blood donation camps at Rampur, Rohru, Kumarsain and Junga. DSP Sharma said they had received a complaint from the employee that the XEN had demanded Rs 50,000 in lieu of releasing an electricity connection on 11 kv for the said industrial unit. The bureau sleuths laid a trap and caught the XEN redhanded in his Nahan office. They later registered a case under the Prevention of Corruption Act and further investigations were underway. Though cases of officials caught while accepting smaller amounts of money had been routinely coming to the fore it was after long that a senior official of the level of an executive engineer had been nabbed while accepting Rs 50,000. According to the information, the victim had submitted her complaint to Chief Minister Prem Kumar Dhumal a few months back through e-samadhan following which the Education Department initiated an inquiry.